This review sample was provided by Tamashii Blu Fin! Get yours today at Big Bad Toystore! The downgraded and simplified version of the OZ-00MS Tallgeese, the Leo is the grunt suit of the Organization of the Zodiac (also known as OZ). A simple, rugged, adaptable, and mass produced suit, it became the basis of the Earth Alliance military and OZ. With this, Bandai gives us the OZ-06MS Leo (Flight Unit Type) from the Bandai Visual giant robot show entitled Gundam Wing. Another offering from their Robot Spirits line, Bandai makes a very solid, expressive, and dynamic piece ready for any and all fans. The back has words and pictures! What very little paint is on this figure—the red—is applied well with no overspray or gloopiness. Everything else is just solid, colored plastic. The Leo’s sculpt is practically spot on, completely screen accurate. Every little detail down to the etches and groves is present and really makes a big impact on the figure. Though the figure has great colors and screen accurate levels of detail the overall level of construction feels similar to that of an amateur model builder’s gunpla. There is a disgusting amount of mold flash left all over this figure which, I feel, is rather inexcusable. And though this may just be a personal quibble, there are no panel lines on this figure to really pull those nice physical details out. This makes the figure feel a little incomplete, but it still holds together as a nice piece. The articulation on the Leo is ludicrous. There isn’t much you can’t make this little guy do. With double jointed knees, double ball jointed ankles, toe hinge, ball jointed hip, thigh swivel, double ab crunch, double waist, double hinged and ball jointed shoulders, single jointed elbows that can reach near 150 degrees, bicep swivels, and ball jointed wrists, the Leo has it all going on; he’s one of the most poseable figures I own. The Leo stands at about 4 ¾ inches tall. Although the Leo is roughly 1/144th sized, he is not 1/144th scale; he still looks great with your other 1/144th scaled Gandamus, however. 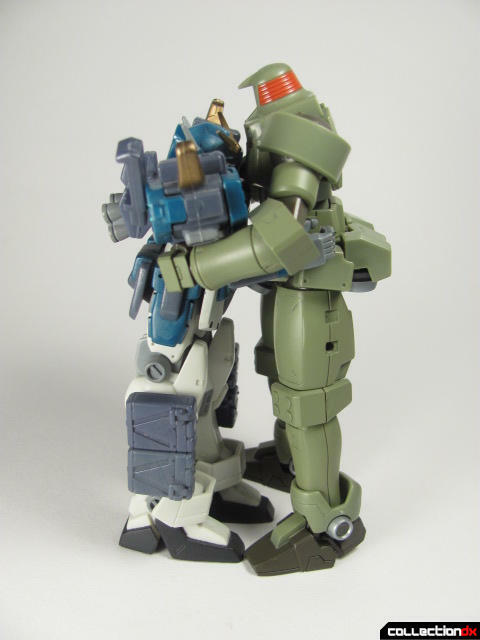 The hands are very easily swapped for one another on a double ball joint. The flight option pack is attached via plugs on the Leo’s back, and the bombs underneath the wings in a similar fashion. The thrusters peg into the legs. The flight option pack has four points of articulation and can move about to replicate terse moments of flight; the legs thrusters can also move about along their peg. The Robot Spirits Leo is a really cool toy. With articulation to rival toy lines that exist solely for that fact and a solidly executed sculpt and construction, it is simply a great toy. And for the ~3000 yen it goes for, a good price, too. The only two problems I have with the figure is the disgusting mold flash and that it feels rather empty without the add-on kit. The add-on kit—sold separately—includes, what I feel, to be some critical pieces to the model: beams sabers, extra hands, etc. It’s still a wonderful piece without these add-ons, but it won’t shine its fullest without them. Get your Leo Flight Type Unit at Big Bad Toystore today! Meh, I want the Virgo (I) and Serpent released. the lack of paint is kinda disappointing but thats how the colour is in the show..I agree about the panel line but looking at how this line try to capture the screen accuracy, its forgivable(at least there are some of it unlike the sazabi) and I think if you added some black lining for the panel line on him,it would look even better. The lack of panel lines is forgivable, but you're right: it wold look so much better with some. Love the GM comic, but that's a little harsh: especially when he's coming into a room with would-be cannon fodder suits (in the wrong pilots hands). btw HGUC Sniper? I love that model! I think what this figure has is the best of the Robot Spirits toy design but maintains its artistic simplicity. All I have built so far have been RGMs (and a couple of Gundams [which aren't UC]), so that club scene was a little restrictive, yeah. And the GM Sniper II isn't my favorite kit, but he's aight. 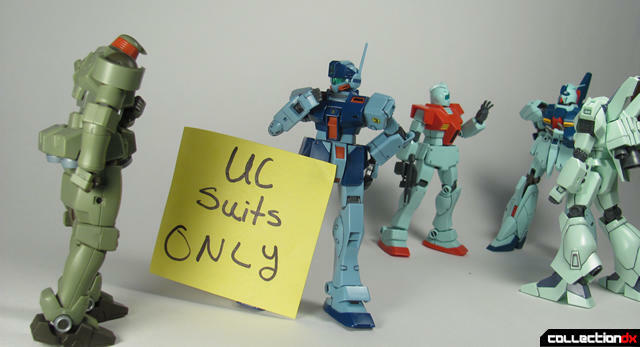 The Leo is a rather simple suit, so it gets away with that pretty well. Huh, dibs for review then. I honestly loved that model. I think the Leo's strength is its simplicity, because all of the future models from the series became more complex and overloaded like the Virgo. The MG Tallgeese model is designed in such a way Bandai could easily convert it into a Leo, but only time will tell before we know where that line goes. I just love the Leo, it's such a pretty little grunt ms. No frills, just military simplicity. Never let a Leo touch a Gundam! They just evaporate! Heck, don't even say "It's a Gundam" too loud or they burst into flames. Seriously though: LOVE IT! I don't have any Leos beyond my small batch of MSiA ones, but I really want this guy at some point (along with the extra parts). Looks fantastic, and I'm glad to see the Leo gets all the articulation he's been denied for so long. I've always loved the grunts more than the main suits, but Gundam Wing grunts have gotten the shaft for far too long. It's great to see them not only get a spotlight, but to have them come out in an age where they can get great attention!